Your Turn: What do you put in your church visitor packet or new welcome folder? Our Welcome Packet consists of a small green handbag (our hospitality colors are gold and green). On the bag we have a gold label that has a Welcome Sign and the church’s name and our Pastor’s picture (she is pretty). Inside we have a personalized pen; a flyer that contains our church’s name, address, phone number, email & website, pastor’s name, a short history of this local church, a list of ministries, office hours and worship times. We also have a small script on biblical hospitality and the various parts of it here at Greater Zion, which include Parking Attendants; Door Greeters, Special assistants and support specialists; an invitation to our Welcome Center and one to return and visit or join us anytime. We also have a business card from the Pastor. Sometimes we include a sweetgrass rose when our donor gives us some. 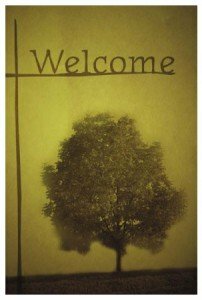 Where can I purchase the Tree of Life Welcome Folder pictured above? We have purchased them in the past, but I am new to the office and can’t find where they were ordered from. I searched my notes and can’t find the source of the image. . . I’ll have to fix that.